Carol Reardon and Tom Vossler set a new standard for field guides with their earlier publication about the Battle of Gettysburg. They have maintained the same high quality for a similar guide on Antietam, the battle that changed the Union's war aims from merely preserving the nation as it was ante bellum to include emancipating four million slaves, a change that fundamentally altered the essence of American democracy. The importance of the battle is matched by the quality of the narrative, maps, and illustrations that make this guide informative and easy to use by experienced battlefield trampers and novices alike. The key to the success of this guide lies in the six questions posed and answered by the authors: What happened here? Who fought here? Who commanded here? Who fell here? Who lived here? What did they say about it later? 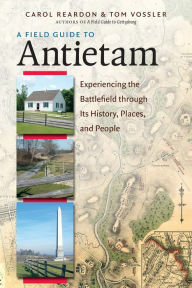 There are even helpful hints on the best way to tour the battlefield including the times and costs for accessing the battlefield park, how to use the roads that traverse its landscape, the stops included on the auto tour as well as others picked by the authors, and the basic etiquette appropriate for making a visit to Antietam's hallowed ground a rewarding experience for everyone. The tour begins at the Visitor Center maintained by the National Park Service. The guide then highlights twenty-one locations in and around the park where significant action occurred. The tour concludes--appropriately for the battle that was the bloodiest day in American history--at the Antietam National Cemetery, the final resting place for 4,766 Civil War dead. In between, the guide escorts visitors and readers to places bearing names like Nickodemus Heights, the Mumma Farm, the Dunker Church, the West Woods, Rohrback's Bridge, the Sunken Road, Boteler's Ford, and other locations that have become iconic in Civil War historiography. President Abraham Lincoln visited Sharpsburg, the Maryland town nearest the battlefield, two weeks after the fighting there concluded. The Union victory, although not conclusive, allowed him to announce the preliminary Emancipation Proclamation. For the authors, "the results of this battle recalibrated the political foundation for understanding and fighting this war." Their fine battlefield guide recalibrates our appreciation for its continuing legacy.